There are two ways to restore the P2P system to defaults. Option #1: Press and hold the reset button on the back of the NVR. This will restore everything back to factory defaults. 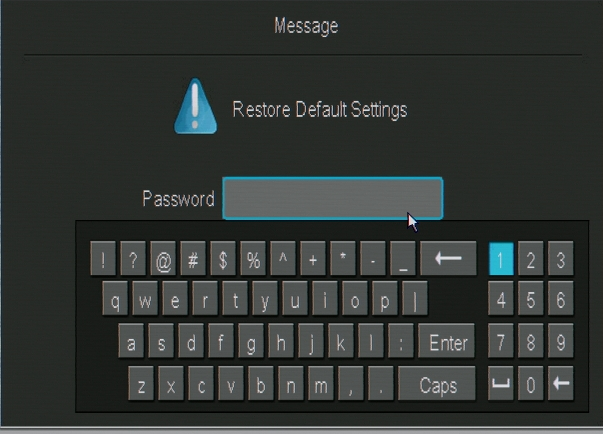 Option #2: Use the Restore to Defaults option from within the menu. 1. To do this, go to the Main Menu and select General Settings. 2. From the list on the left hand side, select the bottom option labeled Default. The NVR will ask you if you are sure you want to restore the factory settings. Click OK in the bottom right to restore the settings. 3. The NVR will then ask you to put in the admin password for the system. Input your password and click Enter. 4. The system will reboot when the restore to defaults is complete.